Published on August 24, 2011. Takes about 1 minute to read. Design Reviews often take up a lot of time but really, it's about first impressions. Is that font unreadably small? Who thought it a good idea to put that obscure graphic there? QuickThoughts to the resque! 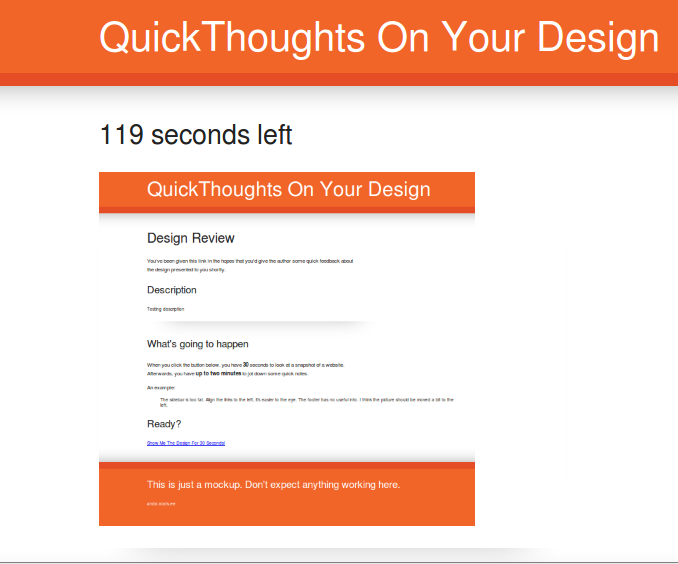 You can upload a snapshot of your mockup and share the link with those whose opinion matters. They have 30 seconds to look at it and up to two minutes to write down their first impressions which You then use to improve the design. I've set up a Kohana installation and coded the backbone of it. Now it's just the matter of coding in some usability features and doing something with the appearance of the site. In short, it's the question of exactly how lazy I am. I never seem to finish a project past this stage. The goal of the game is to react to the words by thinking of another word. There is no scoreboard. For example, if the visitor sees the word 'cat' on a green background, he must think of a word associated with cat, like 'dog'. When the background is red, the word must be completely unrelated, like 'spaceshuttle'. As soon as the word is found, the visitor presses the spacebar and is presented with another challenge. Feel free to steal the ideas and code it yourself. Just drop a link to the implementation.